If you want to know what it means to work as casual labour on your own land, meet P Venkateswarlu in this village of 70 households of the Koya tribe. He has four acres; his two brothers have two acres each. 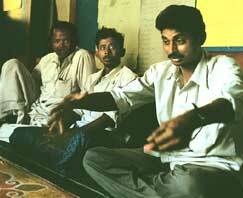 "We ran up debts of Rs 30,000 with dealers of seeds and pesticides five years ago. After repeated crop failure, the creditors asked us to give them five acres of our land, and the credit would get adjusted in the land lease. They would pay me Rs 50 a day to work my land, and they'd walk away with the produce," he says. With his two sons, he would go out to find work most days. "Half the families here have their lands leased out to pesticide/seed dealers, who also double as monopoly buyers of our produce and cheat us on price," says Easam Narasimha, 50. "We'd heard of Punukula's success with NPM, and thought a similar turnaround was possible here," says Nageshwar Rao of the Chapel Rural Development Society, the NGO assisting NPM here. In 2005, M Lakshmi, the representative of the village women's group, travelled to Kosgi in Mehbubnagar to see and learn NPM methods. 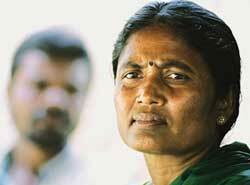 After her training, she and her husband Rajulu became the village coordinators of NPM, her house the NPM secretariat. Venkateswarlu was the first to enrol for NPM: "I was making a loss anyway. I decided to try it out on the remaining land. Lakshmi taught us what she had learnt, with great patience and commitment." In 2005-06, he spent Rs 2,000 on one acre of cotton, earning Rs 13,000 for the produce. "This year, we'll get our five acres back. This entire village will stick with NPM," says his brother Sitaramulu. Others are also getting their land back. This village is already an example, and it is used for extension work across the state. Agriculture scientists sometimes say it is the farmers' wives that make them spray pesticides unscrupulously. They should come here. "A farmer who had signed up for NPM with a women's group brought a bottle of chemical pesticide. The women seized and it threw it away," says V Kistappa of the Rural Integrated Development Society, the NGO helping the government's IKP programme implement NPM here. The greatest proponent of NPM here is a farmer who hasn't adopted it. "After nine years in the Central Reserve Police Force, I returned to do farming in my village, armed with the latest 'scientific' information that I'd picked up during my travels," says N V Narayana, 36. He takes three crops in his seven acres irrigated with a borewell. "I laughed when my brother Narsimhulu enrolled for NPM. He used neem powder and cow-dung urine on his four acres. I used pesticides worth Rs 20,000. I put in the best seed available in the market to his seeds saved from the previous harvest -- and I put them in greater concentrations. I was expecting a yield of 60 bags. I got only 30, making a loss of Rs 15,000. He got 50 bags and a profit of Rs 32,000. I feel like a fool," he says. 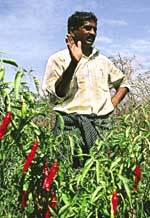 "My cost of plant protection has come down from Rs 1,400 to Rs 600," says Narsimhulu. But groundnut doesn't have too many pests. Why has the response to NPM been the strongest in this groundnut district? "I've never got such good quality yield," says farmer C Prasad; better quality will get him a better price. His neighbour Ramesh Reddy used the same seeds, but used pesticides instead of NPM. His yield is lower and the quality of the nuts is poorer. With a considerable tribal population and a lot of influence from Maoist groups, this district gets special attention from the Union government. The villages and NGOs that have taken up NPM also run projects to promote organic farming. Here, the initiative rests squarely with the NGOs -- not the women's group, as is the case across the state. Yara Raj Reddy, 50, a registered NPM farmer, thinks NPM is about organic manure and vermicomposting. Farmers have stopped using chemical fertilisers under the organic farming project, and think that's what NPM is about. R Sambasiva Reddy has 12 acres and was harvesting chilli when he spoke to Down To Earth: "I've learnt that my soil is zinc deficient. I'm doing organic/NPM for my soil's health. They also say that I'll get a premium price for my produce after certification." His mother-in-law Suguna, though, is unhappy. "The yield is too low," she says. But their are others, like D Ravindra Reddy, who know NPMis only about avoiding pesticides: "Yields are lower as I didn't use chemical fertiliser, but the cost of cultivation is also low. There is no loss."